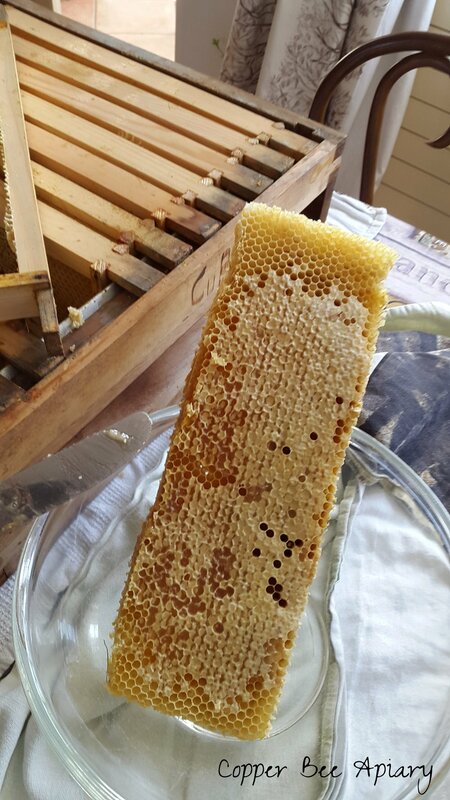 I took this super of honey from the hive at the close of last summer, and the honey was already crystallised in the comb. 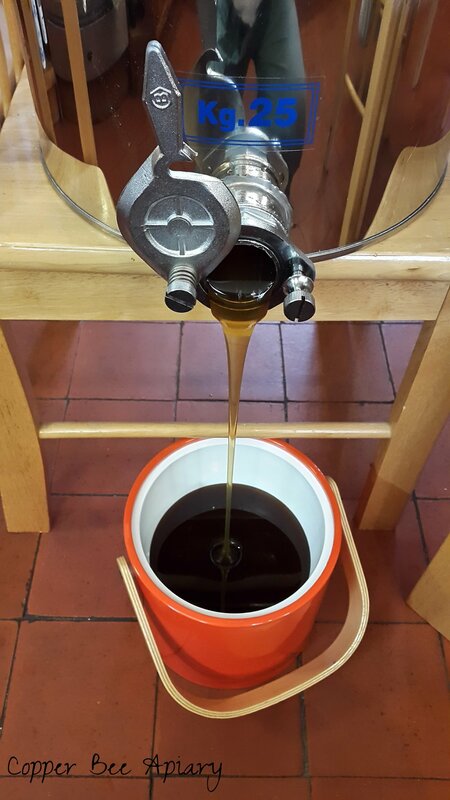 There was no prospect of extracting it in the usual way, with the centrifugal extracter which flings liquid honey out of the cells. I gave it back to the bees as supplemental food over winter, but they didn't eat much of it, so I still had most of a full super in the spring. I decided to melt the wax and thereby get the honey. It was a hot and sunny day, so a solar extraction seemed just the ticket. I thought I'd put all the combs under glass in the sun, sit back and put my feet up, then collect it when it had neatly separated into a layer of molten wax floating on a layer of liquid honey. So I began at the dining table, cutting the combs out of the frames and piling them up in big bowls. Then I put them in a glass cloche in the sun to heat up. I connected a thermometer and watched the temperature rise...and rise...and...plateau. Couldn't get above 40 degrees C.
The wax softened but it was a long way off being molten. So I took the bowls to the kitchen and put them in the oven. That did the trick. 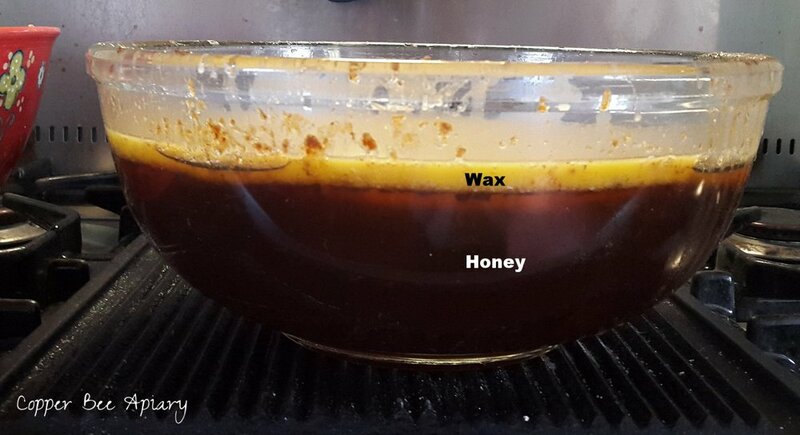 The wax and honey melted down together into a sticky brown pool. 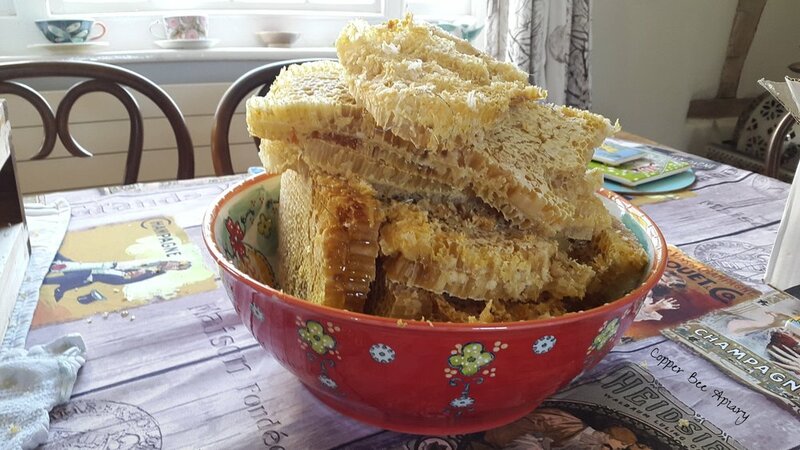 When removed from the oven and left to cool, the wax resolidified into a yellow plate floating on a bowlful of honey. It's striking how high the ratio of honey to wax is. You wouldn't guess from looking at the original honeycomb quite how small the amount of wax in it is. The wax cells are exquisitely thin and light, but hold a vast weight of honey. Cooled (left) and cooling (right). 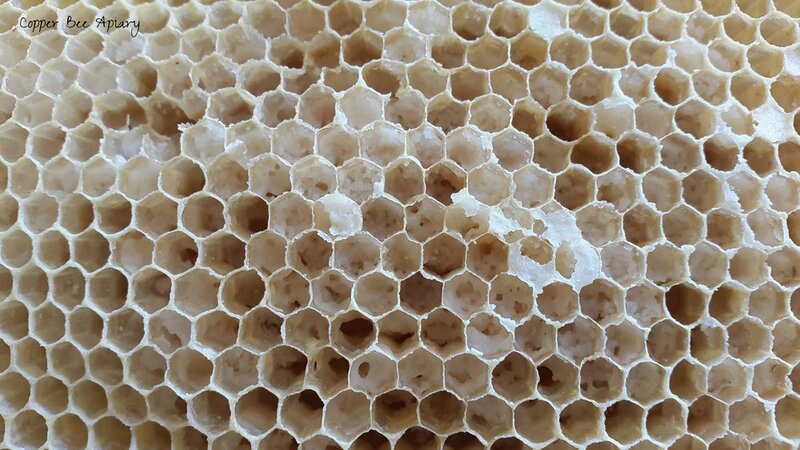 Pollen pellets (stored by the bees in sections of the comb) get sandwiched between the wax and honey layers, appearing as brown lumps that need filtering out.